Famous quote: "There is nothing that is not healed with time. And there is no truth that cannot be reached if you spend enough time searching." Dlanor is Chief Inquisitor of Eiserne Jungfrau and a first-class archbishop, popularly known as "Dlanor of the Ten Wedges" and "Death Sentence Dlanor". She is named after Ronald Knox, and even upholds Knox's Decalogue during her debates. 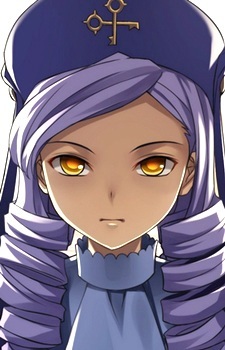 She has the appearance of a young girl with lavender hair and yellow eyes, and wears a uniform similar to that of a cleric. The ends of her sentences are written in katakana as a form of honorific. She is cold towards witches and takes her duties very seriously. Despite her duties as a witch-hunter, however, she is old friends with Virgilia (she classifies Virgilia as one of the "good witches"). Her main weapons are her Red Key and Blue Key, which take the forms of a longsword and shortsword, respectively. She is only dispatched by the Great Court as a last resort after a case is vigorously inspected; in other words, to have Dlanor sent is the equivalent of receiving a death sentence, hence the nickname "Death Sentence Dlanor". Her father created Knox's Decalogue and was a legendary Inquisitor, but broke his own commandments and was interrogated and executed by Dlanor herself, who stopped aging physically and mentally afterward for mysterious reasons.